Howdy, Gameologerinos, and welcome to our weekly thread for the discussion of weekend gaming plans and recent gaming glories. It’s been a tough week around these parts. I know it was hard for me to find the wherewithal to cobble my mind back together and write about some damn video games again. And judging by the comments, these past few days have been hard for you, too. But I was so heartened and inspired by the discussion and companionship I saw in the comments, even over on my article about the Xbox One S, which, given what was transpiring while it was published, seemed so meaningless. As many of you pointed out, people could use an escape. They could use some camaraderie and some compassion. As much as they seem like such silly little nothings right now, games are uniquely suited to putting us in another place and, if only for a little while, relieving us of reality’s hardships. I’m especially glad at times like these that we have What Are You Playing This Weekend?, a place where we can gather to offer love, support and, at the very least, a distraction. This weekend, I’ll be continuing my trek through Dishonored 2. When it comes to escapism value, it’s a double-edged sword. Its world is so lush and well realized, the kind of place in which you can really lose yourself. But politics are a big part of the game’s story and flavor, to the point that if you’d really rather tune that part of your life out right now, it might not help things. Perhaps you’d rather unwind with some good old-fashioned video games? You know, the kind with bright colors and nonexistent storylines and just a couple of buttons to worry about? 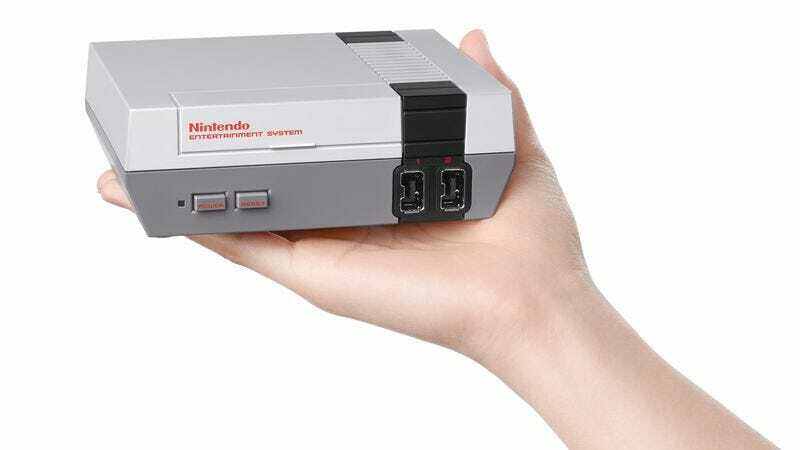 To that end, I wholly recommend trying to get your hands on one of Nintendo’s NES Classic Edition systems, a miniaturized spin on its debut console that comes with 30 games programmed in. This $60 device pumps out some classics—the three NES Marios, both Zeldas, Mega Man 2, Metroid, Punch-Out! !—in a way that’s very accurate to the original NES hardware, and the console itself is adorable. The biggest downside is the controller’s diminutive cord, which is so short that it seems like its designers forgot most people no longer play console games while sitting two feet from a 19-inch CRT TV. Assuming you can make that part work, this thing is a lovely little nostalgia trip, and at times like this, that can be a blessing.